This view looks down from Salisbury Crags. Dumbiedykes housing, demolished in the early 1960s, is in the foreground. The dome of Edinburgh University is in the centre of the picture. 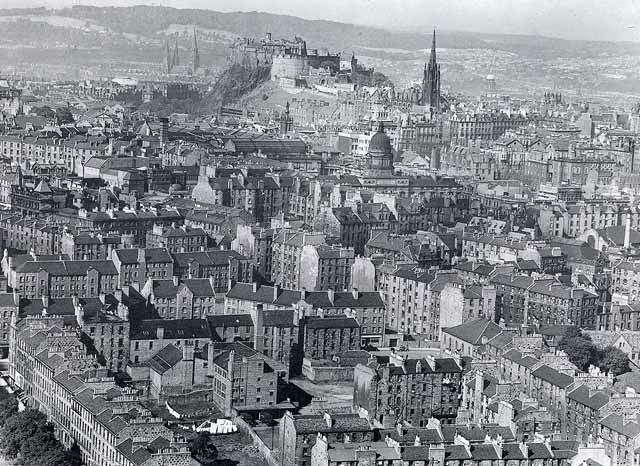 Behind the dome are Edinburgh Castle and Tolbooth St John's Church (now, The Hub) with its tall steeple. In the background are St Mary's Cathedral (left of castle) and St George's Church in Charlotte Square (right of castle). There are two cars parked beside shops (lower centre). Which street are they in? "I was already trying to work out the streets before I saw your question. That block where the two cars is parked must be the Pleasance, exactly as it is now, down to the shop windows. The next street back is Richmond Place and just behind that is Hill Square, with a church in its right front corner, which I believe is now part of the College of Surgeons. In fact you can just see the roof of that in the background, beyond Hill Square." "Many thanks for the beautiful photo taking from the crags. It is a masterpiece. It takes me back to my childhood. I will tell you any street in the photo. The Pleasance is where the two cars are parked. Thomsons Wine and Liquor Store is one of two shops in The Pleasance. It is in the shot. It was called and owned by Mr Thomson. Richmond's the Chemist was the other shop in the Pleasance, far right. It was owned by Mr Richmond, but was nicknamed Franks the Chemist. Salisbury Street can also be seen and the top of the brae in Arthur Street and the waste ground were we used to play. If the photo was a bigger frame you would see the bottom of the brae in Arthur Street. Salisbury Street is the street in the extreme lower-left corner, and Arthur Street is the street running diagonally up, out of the lower right corner. In the shot there are also two vans at the top of the brae. They were bakers vans. Young Brothers Bakers vans are parked in West Arthur Place, towards the bottom right of the picture. There was an iron foundry there in 1850. Young Brothers Bakers had a shop in the Pleasance and the small close was called Oakfield close. It led you in from the Pleasance to West Arthur Place. I used to play in the West Arthur Place waste ground also the Park and the Scotchie as we all did. Cunningham's the butchers and The Store (St Cuthbert's) were in Adam Street, on the far right of the picture." "I have been having another look at the photo. You can see the old Empire Theatre opposite surgeons hall, and also a church in Nicolson Square. I don't know the name of it." "Thank you for a walk down memory lane. I believe that lower right side low building could be The Pleasance Trust. My Father & Mother were caretakers there in the late 1940's. Our front door was opposite Adam Street. The entrance to the Trust was a large arched gateway. - men's, boy's, women's and girls' clubs. There was also a Quaker burial ground with dates in the 1700's. The Meeting House was used by the theatre to store and paint back drops for the shows. The houses on the Arthur St / Pleasance corner overlooked this area. I seem to recall there being a dairy between our house and Arthur St. I don't remember what the other shop was.